It seems the protagonist or a main character of almost every noveI I have read recently has either been molested or abused as a child or both. 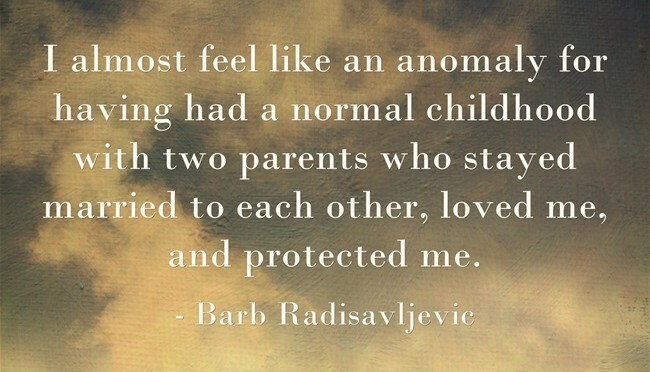 I almost feel like an anomaly for having had a normal childhood with two parents who stayed married to each other, loved me, and protected me. As I read these novels, I’m also very grateful I had this kind of childhood. Leilani (Lei) Texeira had been abused as a child. Her mother had preferred drugs to mothering after her husband Wayne had gotten her hooked and then been sent to prison for dealing drugs when Lei was five. Charlie Kwon had moved in with her mother and molested Lei for six months, often when she was bathing. As Lei put it, ‘Charlie’d had a way of getting to her, twisting everything he did to her into something she’d wanted.’ When Charlie broke up with Lei’s mom, she overdosed, and Lei was sent to live with her Aunty Rosario in California when she was nine. It was the best thing that ever happened to her. But she continued to have flashbacks to the bathtub scenes throughout Blood Orchids. When we meet Lei in the first book of the Lei Crime Series, Blood Orchids (Lei Crime Book 1) , she is a rookie in the South Hilo Police Department in Hawaii. She is pulling a young woman’s body out of the water as her partner, Pono, is phoning in her grisly discovery. After Lei pulls a second girl from the water it is evident they have been murdered, and Detective Michael Stevens, from Los Angeles, and his partner Jeremy Ito, are put in charge of the case. Lei isn’t happy about that. Since she discovered the bodies, she wants to be involved in helping to find the murderer. Finally, Stevens allows her to help since the help he has requested from other departments has not been given. Lei and Stevens spend more time together as the case unfolds. As the book (and series) progresses, much of it deals with the growing attraction between Lei and Michael Stevens. Meanwhile, Lei has discovered she has a stalker who puts threatening notes in her mailbox and on her porch. Even though she has a security system and a pet Rottweiler, Keiki, she is still afraid. She wonders if her neighbor, Tom Watanabe is her stalker since she thinks he looks at her in a creepy way. The reader sees several possible suspects besides Tom. I’m not going to spoil the book for you by mentioning them, but I did suspect the right people. I like that the author gave me enough clues to figure out who the killer was. We see the murder of Mary, another woman police officer and a friend and classmate of Lei before the killer lets readers know that Lei herself will be his next target. I have trouble with books like this because they use a technique that builds suspense to the point that I can’t handle it. The reader knows from almost the beginning that a serial killer is responsible for the deaths of the two girls Lei and Pono found drowned. Throughout the book there are passages where the killer speaks (in italics), savoring his mementos from his victims and the photos of them he has so carefully posed. He also lets the reader know ahead of time that there will soon be another killing and in some cases, who it will be. I’m sure this technique appeals to some readers who enjoy the suspense and the anticipation of the next murder. I don’t. I prefer books where the body is found and the detectives go to work methodically to find the killer as we follow in their steps and think with them. In this book, the reader knows more than the police. I empathize too much and can’t stand knowing a character I’ve gotten to know is going to be grabbed and probably killed and that I will have to watch it happen. Were it not for that, I would have found the book a fast-moving and entertaining escape. I just don’t consider being scared over and over entertaining the way some people do. I did enjoy the interaction between Lei and Pono and watching the romance between Lei and Stevens develop. Lei has frequent flashbacks to the abuse she faced as a child, and what happened back then affects her ability to trust Stevens and her ambivalence creates tension. Stevens considers Lei’s willingness to take initiative in her work a strong point. She is also impulsive, though, and takes unnecessary risks. I just can’t bear to follow her this time. I’m sorry I’ll have to forego finding out what happens next in Lei’s relationship with Stevens and that I won’t find out if I’m right about the identity of the mysterious Timekeeper. I would recommend this series to those who relish suspense and thrive on thrillers. The police detective work is thorough and chances are you will predict the killer if you pay attention to the clues the author lets you see. Toby Neal knows how to create a mood that draws the reader into the book from the first page. just to see what happens. I suspect Lei will find herself in a very dangerous position it will take all her strength and survival instincts to get out of. I don’t want to watch, which is why I’ll skip the dramatic build-up and climax and just see how it is all resolved. In spite of the past pain in her life, Lei is a very caring detective who wants justice for the victims of the vicious. I think you will enjoy getting to know her.